Summer in Chicago is all-too fleeting. The fall temps are bound to drive us back indoors before we know it, which means we’ve got to make what’s left of the season count. That shouldn’t be too hard, because the Windy City is chock-full of adventure — but don’t take our word for it. According to a recent Facebook study of the fittest cities in America, Chi-town proudly took home the title of “Most Adventurous City.” So, in an effort to help uphold our new standing, try out one of these rad activities the next time you're thinking about just going for a walk along the lake. “Free falling” gets a whole new meaning at this awesome new adventure site in Marseilles — which is just a little over an hour outside of the city. With six different cables roughly 85 feet up and a new dual racing zipline, you’ll be flying through the sky at almost 50 mph. Adrenaline rush? Oh, yeah — $100 to $110 will buy you three hours of guided fun — day or night. Even if you're working with a tight schedule, you can still get in on the action for just $45 for an hour of heart-racing fun. Zip Chicago Canopy Tours, 2681 East Route 6 (in Marseilles); 815-795-5001. We might not have an ocean to surf in, but we’ve got Lake Michigan and plenty of paddle boards to make for a wet-and-wild adventure! This hybrid of surfing and kayaking is fun and challenging and offers a great full-body workout. Chicago SUP has upped the ante even further with fitness classes that introduce yoga, pilates, and other advanced moves to the board. If you’re just starting out, lessons and expeditions are also available, as are rentals for those brave hearts ready to explore the waters on their own. Chicago SUP, 1603 North Lake Shore Drive (at North Avenue); 773-575-4787. Ready for the ultimate thrill? We’ve got one word for you: skydiving. Nothing says adventure quite like jumping out of an airplane, and if you’re up for it, Chicagoland Skydiving can help you cross one off the bucket list — in one piece, no less! They’ve got the highest tandem skydive in America (18,000 feet — eep! ), and prices ($189 to $289) include training, equipment, instructor fees, and lift ticket. Sorry, you're on your own for self-confidence. Chicagoland Skydiving Center, 1207 West Gurler Road (in Rochelle); 815-384-2792. 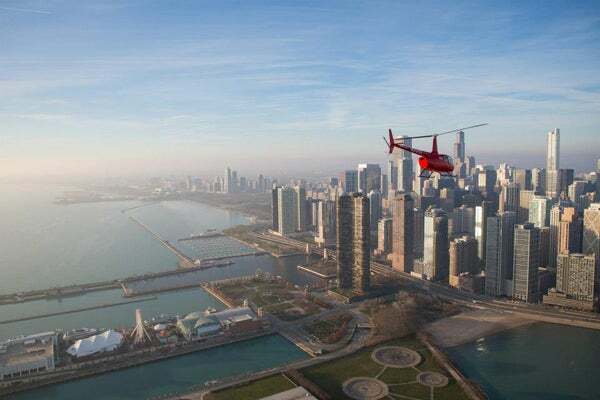 Chicago Helicopter Express is a really cool way to see the city from an entirely new vantage point — no matter how long you've lived here. Opt for a scenic tour (starting at $199 person; discounts for groups) or travel in style in one of the company’s three fleet choppers. While it kinda sounds like an episode of the Bachelor, we sure hope someone asks us out on a date that fun! Chicago Helicopter Express, 1071 South Wolf Road (in Wheeling); 856-359-4354.